Private 201374 Philemon Frances W Hamblin, 1st/4th Battalion, Hampshire Regiment. Philemon was born in 1896, the son of another Philemon (known as Phil) Hamblin and his wife Annie (née Wallis). His father was a carpenter and joiner. Shortly after Philemon’s birth the family moved to No 2 Jubilee Terrace, Jubilee Road, Newbury. In 1904 the family moved to Enborne Road to move in with Philemon’s grandfather Richard, a chimney sweep; Philemon senior becoming a sweep himself. The 1911 census finds the family in Pound Street (almost certainly in the same house as a portion of Enborne Road was renamed Pound Street); fifteen-year-old Philemon was working as a draper’s apprentice. He signed up in April 1915, opting for service with the territorial battalion of the Hampshire Regiment; his service record has not survived, making it impossible to learn much of his time with the Regiment. He did not enter a theatre of war before 1916 (he did not qualify for the 1914-15 Star). The Commonwealth War Graves Commission roll of honour lists him as a casualty of the 2nd/4th Battalion, Hampshire Regiment, whereas the circumstances of his death indicate that he was actually serving with the 1st/4th Battalion. Perhaps he spent time with both battalions? The 1st/4th Battalion spent the war in the east, sailing for Karachi in October 1914. They went in order to take part in a campaign against the Ottoman Empire in Mesopotamia (modern day Iraq). In March 1915 the battalion had landed at Basra as the campaign began. By the time of the armistice in Europe on 11 November 1918 their HQ was at Zinjan (now Zanjan) in north-west Persia (Iran); some units of the battalion had been as far north as Baku (now the capital of Azerbaijan) the previous month. According to a newspaper account of his service (below), Philemon left for the east in September 1915 and, at a later date, was transferred from the Hampshires to the 33rd Division Signals, working as a dispatch rider, but there are problems with this account. Firstly the company should be a brigade unit, not division (the 1st/4th Hampshires were part of the 33rd (Indian) Brigade). More of a problem is that Philemon’s war medals (British War Medal & Victory Medal) were awarded from the Hampshire Regiment, not the Royal Engineers as would have been the case had the suggested transfer taken place. It is, of course, possible that he was attached to the brigade signals for a period while remaining on the strength of the 1st/4th Battalion. Following the armistice the British remained in Persia, principally to protect their interests in the oilfields. In August 1919 two companies of the 1st/4th Hampshires were in action at Resht as the British sought to combat the Bolshevik influence of Mirza Kuchak Khan. The battalion left for home in November 1919. HAMBLIN. – Nov 5th (by cable), Lance-Corporal Philemon Hamblin, second son of Mr and Mrs Phil Hamblin, Rosemore Villa, Enborne Road, Newbury, of pneumonia, aged 23 years. – A life cut short in this world to be perfected in the next. Lance-Corpl Philemon Hamblin. – Mr and Mrs Hamblin, of Pound Street, received last week the distressing intelligence of the death of their son on his way from India. Deceased joined the colours in April, 1915, serving with the 1/4th Hants. He left for India in September, 1915, being then transferred to the 33rd Divisional [sic] Signals. Afterwards he became dispatch rider, a post which he carried out until his time came for demobilisation. Starting for home, he contracted pneumonia on the course of the voyage, and passed away on November, 5th, 1919. The news was communicated to his parents from Port Said. The news of his death was transmitted from Port Said, suggesting that he may well have perished while the ship was in the Suez Canal. Philemon has no known grave, he may well have been buried at sea. The Commonwealth War Graves Commission, which maintains the national roll of honour for the dead of World War I overlooked Philemon for over 90 years, until researchers from the In From The Cold Project [link] discovered he was missing. The omission has now been rectified and his name will be added to the Brookwood (United Kingdom 1914-1918) Memorial in due course. This memorial was created in 2004 to hold the names of men and women who, like Philemon, were overlooked when the roll of honour was compiled after the war and who have recently been identified. 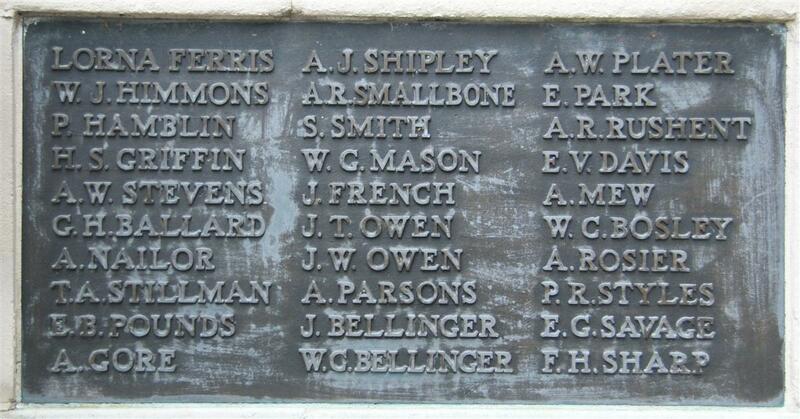 Locally he is remembered on Panel 1 of the Newbury Town War Memorial. Most of the names on the memorial are listed in random order, but there are some exceptions. Brothers are usually listed together and the first few names are deliberately placed. The first name, Lorna Ferris, is the only woman in the list. The second, Jack Himmons, was the first Newburian to die in service. Philemon Hamblin is the third name, quite possibly deliberately positioned here as the last Newburian to die while still in service (others on the memorial died of sickness or wounds at a later date, but after they had been discharged from the services).